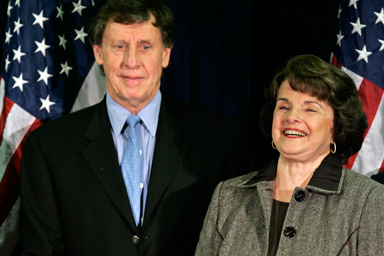 Senator Dianne Feinstein with her husband Richard Blum at a Democratic election party in San Francisco, November 7, 2006. On January 20, 1980, in San Francisco, California, finance capitalist Richard C. Blum (born in 1936) and the ambitious Democratic Party politician Dianne Feinstein (born 1933) were married in a wedding ceremony at San Francisco City Hall. This marriage created a family economic and political alliance that in a little over a decade would allow them to become the top power couple in the state of California with a place on the national and world stages. They remain at the pinnacle of power today, he as a billionaire financier, speculator, real estate executive and deal maker; she as the senior Senator (California’s highest federal official), from the largest and most powerful state in the United States. They exemplify power as it is now wielded in the higher circles of the class system of the U.S. today, and illustrate well the dismal results of this system. This system is best characterized as a plutocratic kleptocracy, completely lacking in authentic democracy, operated by and for corporate racketeers, in short, a dictatorship of big capital, the top 1% of wealth holders, which makes up a ruling class. 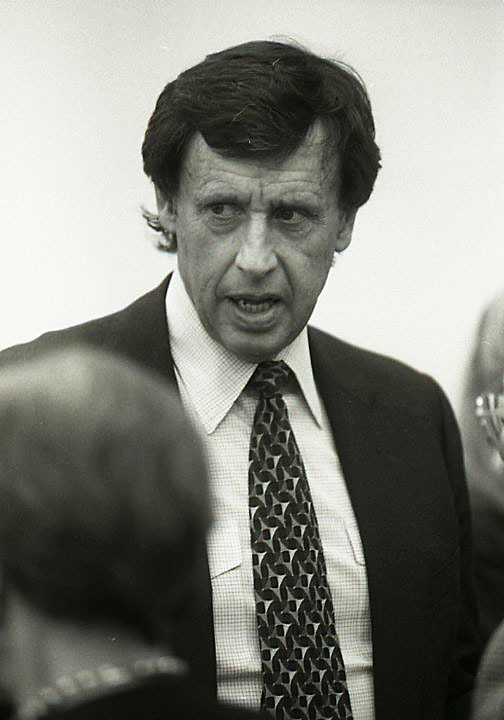 Richard Blum at his swearing in for a city commission post, January 22, 1996. Blum is finance capital personified, and Feinstein precisely illustrates the corrupt, war-mongering, pro-corporate politicians who inhabit the upper reaches of the U.S. ruling class. To fully comprehend their rise to power, vast wealth and socio-political stance, one needs to understand the key developmental trends in the U.S. and world political economy during Blum-Feinstein’s rise during the last few decades. Also necessary is a comprehension of how Blum-Feinstein have both adapted to and helped quicken these developmental trends. The financial capitalist now plays the leading role in capitalist development, this type of capitalist has taken over from the formerly dominant industrial capitalist. This process also has financialized class and class relations; these are more and more characterized by extreme differences in wealth and income from the top to the bottom of the class system. The top 1% of U.S. wealth holders, Blum and Feinstein among them, currently hold about 35% of the total wealth of the nation (43% of the financial wealth), and the top 20% have 85% of the total wealth. Conversely, the bottom 80% of the population owns only 15% of the wealth, the bottom 40% of the population owns only 0.3% of the nation’s wealth (basically nothing), and about one in six Americans (almost 50 million people) live in poverty, with no wealth and lacking even a minimal income. In the case of Blum-Feinstein, we can see what being in the top 1% means. They currently own a private jet, a Gulfstream G650, worth $55 million in 2008. Blum-Feinstein also own an entire 161 room San Francisco hotel (The Carlton) and at least six other homes. At a low estimate, including their hotel, their personal real estate holdings, together with their private jet, are likely worth well over $100 million today. Blum’s empire begins with his ownership of Blum Capital Partners, a firm he founded in 1975. In its 2005 edition, one standard industry source, Pratt’s Guide to Private Equity Sources, lists Blum Capital Partners as a firm “investing own capital” and having $1.589 billion under management. Two other, more recent sources, list the assets of Blum Capital at the higher levels of $2.8 billion and $4.5 billion. Blum’s firm’s clients reportedly include some of America’s wealthiest people and largest corporations, like oil heir Gordon Getty and Bank of America. Blum Capital Partners also has a joint venture with a much larger firm, The Texas Pacific Group (TPG) and Blum Capital Newbridge Capital to conduct this joint venture. Blum has been a Co-Chairman of both Newbridge and TPG. Feinstein and Blum at a Lawrence Livermore Lab event in 2006. Neoliberalism is a version of extreme free market thinking, putting forth the pure logic of capital. Neoliberalism’s critique and actions aim not only at ending the regulatory and welfare states, it wants to shrink government’s role in economic and political life down to the point where the wealthy corporate ruling class will totally control economy, society, and political life with no interference. Long theorized by right wing thinkers, neoliberalism came into vogue during the 1980s as a way to open up more economic living space for capital, “opening new markets.” As these areas are opened up, one result is an increase in the commodification of various aspects of life. Neoliberalism also opposes the former Keynesian consensus that fostered aspects of the welfare state, that is, offering some government benefits to the working class to pump up effective economic demand. According to neoliberal ideology, government should be weak and market/commodity relations dominant, so the Keynesian approach should be scrapped. Neoliberalism as an ideology is completely hypocritical however, because virtually all of the government welfare, sweetheart contracts, tax cuts, subsidies and bailouts given to major corporations continue under neoliberal governance, only the Keynesian type benefits to workers are really cut. In actual practice, therefore, it is a philosophy meant to make workers and their unions pay for the crisis tendencies of capitalism, making the capitalist crisis actually a working class crisis. Under corporate neoliberal thinking over the past thirty years, all aspects of the New Deal reforms of the 1930s have been under increasing attack. Another aspect of neoliberal ideology is the ongoing attacks on unions, since union organizing and action to protect workers distorts the operations of the “free” market. Corporations are free to export jobs and income to low wage nations, but workers are often unjustly prevented from organizing unions both at home and in repressive nations abroad. Blum and Feinstein’s policies and actions promote neoliberalism. Blum’s field of operation is worldwide, exporting jobs overseas to capture surplus value in areas of the world that are expanding rapidly at a time when there is stagnation in mature capitalist economies. Blum’s foreign investments have focused on Asia, including China, Australia, and Korea, often through the TPG and Newbridge Capital. Feinstein and Blum are also major investors in two private educational corporations, the Career Educational Corporation, and ITT Educational Services. At the same time, Blum donated heavily to the political campaigns of California Governor Gray Davis, amounting to at least $75,000 in a two-year period beginning about 2000. As a result, Davis, following his “pay to play” politics, appointed Blum to be a member of the University of California Board of Regents. Within a few years, Blum became the Chairman of this Board while it raised tuition for the University’s students again and again, increases that amounted to 32% in only one year. Students have had to take out massive loans to attend school. One source indicates that the amount of debt loaded on all U.S. students has jumped from $90 billion in 1999 to $550 billion in 2011. As students were priced out of an increasingly expensive public university system, the inferior, privately operated correspondence type diploma mills where Blum had major investments became increasingly attractive. Not to be left out of the drive to weaken public education and teachers unions in order to open space for private capital accumulation, Feinstein had become a supporter of school vouchers by 2003, undermining public schools by allowing parents to use public money to pay for tuition at private or parochial schools in Washington, D.C. (San Francisco Chronicle July 23, 2003:A3). Senator Dianne Feinstein speaking at the annual gala of the Human RIghts Campaign, October 22, 2011. A final aspect is cutting taxes on the wealthy, and, of course, Feinstein consistently favors such cuts. One example is Feinstein’s support for a phase-out of inheritance taxes on large estates. In July of 2000, she was one of a small group of Democratic Senators defending and voting for a Republican sponsored bill to repeal an estate tax law first passed in 1916, a law that applied to only the top 2% of taxable estates. The imperialist policies to be followed by the U.S. and NATO are discussed and developed by think tanks and policy forming organizations the leading U.S. private, (closely connected to official circles), such as the Council on Foreign Relations (CFR), and the Brookings Institute. A similar organization, only international in membership is the Trilateral Commission, which draws its members from many countries in Europe, North America and Asia. Blum-Feinstein are closely connected with all three of these private foreign planning organizations and their imperialist policies. Both Blum and Feinstein have been members of the CFR for a number of years (membership is by invitation only). Blum has been a trustee of and part of the power structure of the Brookings Institute for years (Brookings regularly hosts the “Brookings-Blum Roundtable” discussion series) and Feinstein currently serves on the North American branch of the Trilateral Commission, after having first become involved with this organization in 1988. One result of these close connections is the fact that Feinstein is an enthusiastic war hawk and strongly supports all the current wars and occupations of U.S. imperialism, from Iraq and Afghanistan to Libya. Feinstein also chairs the Senate Intelligence Committee. 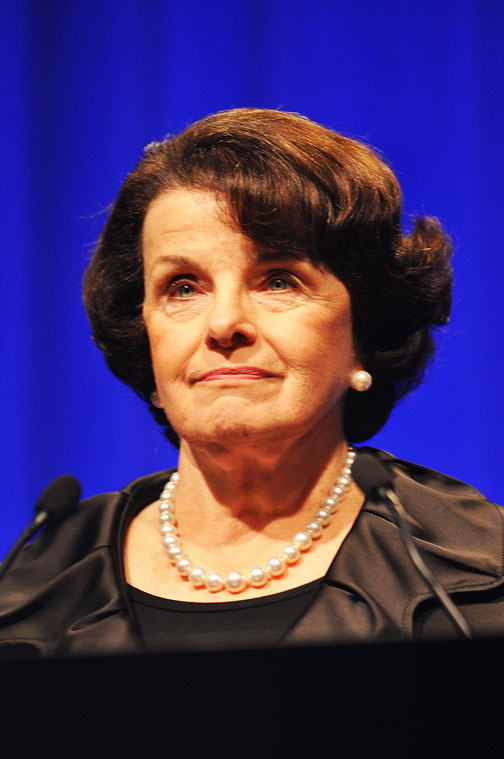 She approved of the appointment of General David Petraeus to head the CIA, saying that she had “enormous respect” for him, and that the U.S. should “…put all of our eggs in the Petraeus basket…” This illustrates that Feinstein has embraced the dangerous and illegal new method of warfare now being waged by the CIA under Petraeus. This new way of war is to send robotic machines (drones) over borders to kill thousands of people, even American citizens who are viewed as enemies. Blum and Feinstein are key players in what can best be called the San Francisco Democratic Party political machine. Feinstein conducted Jerry Brown’s wedding (to a former Vice President of the Gap) where the entire Bay Area political machine was present, and hosted a wedding shower for Gavin Newsom at her Pacific Heights mansion, illustrating her close personal, economic and political ties to key members of this group. The group obviously also has important national level connections as well, former Vice President Al Gore is a long time friend and business partner of Blum. While pretending to represent the interests of the rank and file, once in office, Feinstein and other corporate ruling class supported politicians payoff their partners with policies favorable to their interests, including government contracts. Again Blum and Feinstein are prime examples of how this corrupt system really works. Senator Feinstein, who was already in October of 1994 called “… the most prolific fund-raiser among all federal candidates” by the Los Angeles Times (October 28, 1994: A1), has received large campaign donations (in the thousands from each one) from a truly amazing list of top California and national level corporations. In 2007 investigative reporter Peter Byrne published a series of reports that showed that her actions in the early 1990s was only the beginning of Feinstein’s aiding her husband’s firms. As chairperson of the Senate’s Military Construction Appropriations subcommittee from 2001-2007, Feinstein supervised and supported the appropriation of over $1.5 billion for two military contractors, URS Corporation and Perini Corporation, both companies that Blum had a controlling interest in. Blum later sold URS for a reported personal profit of $57 million. 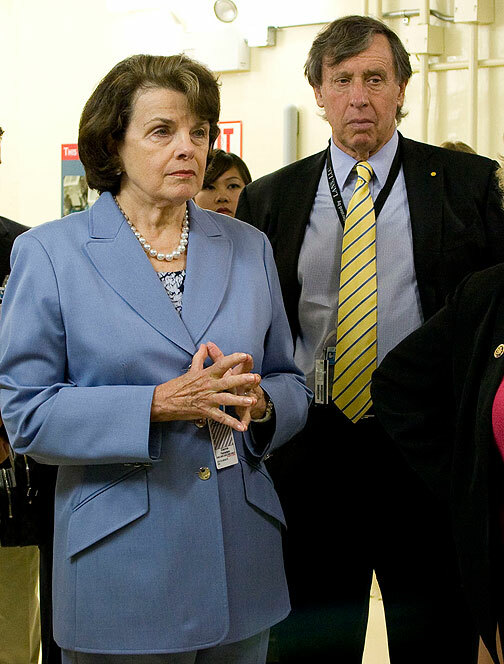 When Feinstein’s actions were exposed in early 2007, she abruptly quit her post on this subcommittee. Blum returns the favor, raising more money for his politician wife than any other individual. He arranges contributions and loans to her campaigns in the millions. At least sometimes this got the power couple into trouble, even with the weak campaign finance laws that exist. In Feinstein’s failed 1990 Governor campaign for example, the Feinstein campaign failed to disclose a series of bank loans arranged by Blum that amounted to at least $2.9 million. Her campaign was fined a total of $190,000 by California’s state watchdog agency, the largest such cash settlement in state history, for an “outrageous case of gross negligence” (Los Angeles Times December 22, 1992: A1, A29). A more recent example of gross negligence and incompetence in the area of campaign finance on the part of Feinstein and her staff was exposed when the FBI arrested her campaign treasurer, Kinde Durkee for stealing funds from a number of campaign accounts that she managed, including Feinstein’s (S.F. Chronicle September 14, 2011:A9). The ongoing and accelerating global ecological crisis is deeply rooted in the anti-ecological imperatives of capitalist production and exchange for profit and accumulation. Corporate capitalism is a system requiring constant “expand or die” growth, a system whose main measure of success is how much capital is accumulated. This results not only in human alienation, it also results in the alienation from and destruction of entire natural ecosystems, such as forests, rivers, and grasslands. Blum and Feinstein routinely undercut ecological needs in favor of the accumulation of wealth and power. One example is Feinstein’s relationship to wealthy corporate farmer Stewart Resnick, the owner of over one hundred thousand acres of prime farmland in the San Joaquin Valley. He has written big check after big check to her political campaigns, as well as hosted her at least two of his mansions. Over the past few decades he has also given several million dollars to the Democratic and Republican Parties and their candidates. Then, when Resnick called Feinstein in 2009 to weigh in on the side of corporate agribusiness in a drought fueled ecological dispute over water to big landowners or water for the Sacramento-San Joaquin River Delta’s ecological needs, Feinstein jumped in, pushing the agribusiness viewpoint onto two Cabinet level secretaries and calling for a sweeping review of the science to allow more water to go to Resnick and other big operators. Due largely to excessive water diversions, the Delta’s ecology is in serious trouble, with fish populations in catastrophic decline. Blum and Feinstein also favor and work for “wilderness,” she in the Senate sponsoring legislation to set aside public lands as preserves, and he as a member of the Governing Council of the Wilderness Society. The nature and politics of Blum’s Wilderness Society can be seen by looking at its Governing Council and one of its “corporate partners.” The Governing Council is filled with the super rich like Blum and includes a member of the Getty oil family, a member of the Roosevelt family, a Rockefeller family in-law, a Texas Pacific Group private equity billionaire, an adviser to Clinton-Gore White House and a past chairman of Recreational Equipment Company, which sells products for outdoor activities. Its leading corporate partner is Bank of America, which, for years financed mountain top removal to mine coal by Massey Energy and International Coal Group. Under the pressure of direct action against it, the Bank of America cut back on but did not end such financing. The Blum-Feinstein-Wilderness Society approach of creating a few islands of non-development in a sea of life destroying capitalist ecocide is clearly inadequate as a strategy of ecological and human survival. The five interrelated waves of our age, and Blum-Feinstein’s role, illustrate that the Democratic Party and its leaders are every bit against the people’s interest as the Republican Party. Both favor the corporate state and capitalist austerity, imperialism, war and capitalist ecocide. Blum-Feinstein stand solidly for the financialization of accumulation and the private use of this wealth to benefit a small group of wealthy owners (the 1%); they stand for neoliberal ideology; for imperialism, militarism and war; for undemocratic corporate political rule; and for weak and inadequate measures to confront the ecological crisis. Historian, author and activist Laurence H. Shoup lives in Oakland, California. His most recent book is "Rulers and Rebels: A People’s History of Early California, 1769-1901".